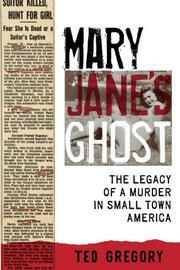 The story of an unsolved double murder from 1948 in the small town of Oregon, Illinois. In a meandering account that sometimes shifts away from the cold case altogether, Pulitzer Prize–winning Chicago Tribune reporter Gregory (co-author: To Chase a Dream: A Soccer Championship, an Unlikely Hero and a Journey that Re-Defined Winning, 2014, etc.) opens with his receipt of an envelope from a stranger residing in Oregon, Illinois. The sender was Michael Arians, owner of a small business and former mayor of Oregon. Arians never knew the two murder victims, young teenage lovers named Mary Jane Reed and Stanley Skridla. Arians, however, was incensed that nobody had been arrested, that the county sheriff’s department might have initiated a coverup, and that contemporary residents failed to honor the memories of the dead couple. After Gregory convinced his editors to let him investigate the cold case, he became as fascinated with the story behind Arians’ quixotic quest as with the details of the homicide. Arians developed an intriguing theory about the case (no spoilers here), but the author began to believe that other theories were more accurate. As Gregory was trying to carve out the time to seek the smoking gun, downsizing at the Tribune threatened his ability to proceed. Throughout the book, readers will navigate through digressions about American daily newspapers, Oregon’s history, Illinois geography, and other unrelated feature stories that the author was pursuing. Eventually, though, Gregory turns his attention back to the double murder: the array of suspects, Arians’ theories and his business ventures, which were complicated by financial difficulties, and, toward the end of the text, Arians’ meltdown due to circumstances beyond his control. Soon after meeting Arians, the author decided that the obsessive sleuth was not crazy, but the Arians minibiography comes across as pedestrian. The narrative, while mostly fast-paced, would feel more compelling without some of Gregory’s tangents, and the failure to identify the killer(s) leads to a flat ending.